Whatever your plans may be for this year's Saint Patrick's Day, do yourself a favor: avoid the green beer. I must admit that this silly tradition always disgusted me. Green beer is, simply, an abomination. The thought of dumping green food dye into one's pale lager to celebrate the holiday just makes my hair curl. If you want to really partake of the holiday festivities properly, drink some proper Irish beer. Then you can at least safely overlook the fact that your corned beef and cabbage is not really Irish at all, but a Jewish dish from New York City that Irish immigrants adopted for their own. That sort of thing is bound to happen in America, the world's great melting pot. Naturally, the overwhelmingly dominant name in Irish brew is Guinness. The name Guinness did not always mean stout to my ears. 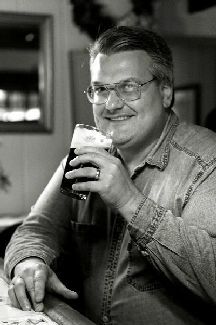 For a long time in the early days of my life, Guinness meant the Book of World Records. No doubt the brewer published this book with an eye toward settling disputes between patrons in pubs. But for me, the book meant a fascinating read every day when I came home from elementary school. I would sit myself down with a bowl of cereal and read about how the Verrazano Narrows Bridge was (at the time) the world's longest suspension bridge, or about how a famous glutton named Bozo Miller wolfed down 300 clams in an hour. 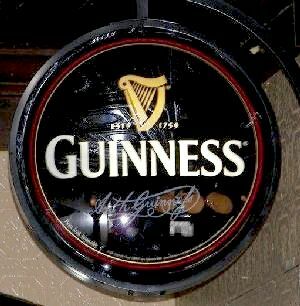 It wasn't until a number of years later, in a Whippany, New Jersey pub called Molly Malone's, did I become formally introduced to the pleasures of the famous Guinness Draught. One of the really interesting things I can say about draught Guinness Stout is that, at least for me, it never seems to be exactly the same in any pub I visit. This effect is, no doubt, largely due to the particular gas system being maintained at the particular bar I'm visiting. The dense creamy head is due to a blend of carbon dioxide and nitrogen that must be properly balanced to ensure the correct pour. If this mixture is out of balance, the result may be a flat stout. I once enjoyed a Guinness at a French-Irish cafe in Manhattan (alas, I cannot remember its name!) that was perhaps the finest pint of the draught that I've ever quaffed. Its creamy lace hung around the edges of the pint sleeve right down to the last rapturous gulp. By contrast, at a local pub not far from where I live (which will remain unnamed) I found the stout head quickly evaporate in a mass of large bubbles, leaving an insipid beer with no life left in it. So, it really does pay to know what you're doing when investing in a tap system for your pub. But Guinness Stout does not live by gas alone. One of the main ingredients that contributes to its classic flavor is a proportion of unmalted roasted barley that is added to the mash when it is brewed. The result is a brew that appears to have considerably more substance to it than it really has. It is impressively low in calories and its alcohol content clocks in at less than four and a half percent. It makes for a wonderful session beer. 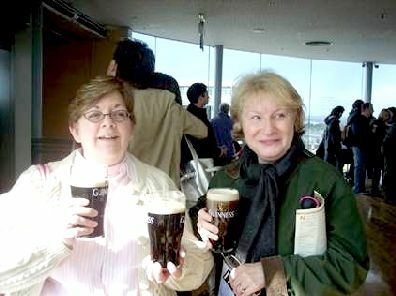 THE GUINNESS STOREHOUSE IN DUBLIN, IRELAND - THE SOURCE OF THE HOLY NECTAR. People who have visited Ireland have often told me that the domestic Irish version of Guinness Draught is stronger and fuller bodied than the stuff made for American palates. This is completely untrue, and these tourists are letting their imaginations run away with them. If anything, the draught Guinness in Ireland may have actually less alcohol in it, due to the high taxation rate on booze in Ireland. That does not mean that stronger versions of Guinness do not exist. They are out there, but they are not available on draught. One of these is the heady Guinness Extra Stout, which is still available in American markets. This chunky brew weighs in at around six percent alcohol by volume, but it is the huge infusion of roasted barley in this stout that tells the real story. I can best describe it as the beer world's answer to espresso - a massive shot of strong coffee-like roastiness, in stark contrast to the gentle roastiness of the draught version. Some people find Guinness Extra Stout a tad overpowering to drink straight, and prefer to mix it with a lager to make a half and half. There is yet another version of Guinness that was never available locally. It is called Foreign Extra Stout, and I must admit that I have never had the opportunity to try it. It is (or was) made primarily for the Caribbean market, and it was over seven percent alcohol by volume. I can well imagine what it might be like imbibing in such a brew in a hot tropical climate. It would be dishonest to imply that Guinness is the only brand of Irish stout out there. A few others do still exist, but they are hard to find in the American market, especially in recent years. One of these is the very mellow Murphy's Stout. Murphy's has a slightly lighter color than Guinness Draught, and its roastiness is even more restrained. Then there is Beamish, a fine stout that has a more pronounced malt character than either Murphy's or Guinness. I once heard that in Northern Ireland, Murphy's was considered to be a favorite among Catholic drinkers, while Beamish was gravitated to by the Protestants. It is sincerely hoped that all drinkers in this corner of the world have since adopted a more ecumenical attitude in their imbibing. If drinking stout is not your thing for St. Paddy's, then perhaps Smithwick's Ale would suit you better. Smithwick's is a classic Irish red ale, which is relatively light on hop bitterness, and has a pronounced malt character. Its strength is right at four and a half percent, so like Guinness it makes for a perfect brew to whittle away a few hours without becoming stupefied. Smithwick's Ale is now actually brewed by the same company that makes Guinness. It can be assumed that its quality is as still as much up to snuff as it was when it was still an independent brewery. 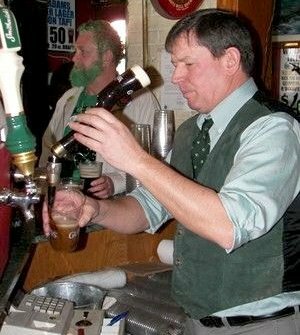 The only regret that I have about St. Patrick's Day is how crowded the pubs become when the once-a-year drinkers make their way in to celebrate. I always treasure my seat at the bar, and on this day it is often standing room only. But I suppose that I can suffer this small inconvenience in honor of the saint who drove the snakes out of Ireland. That is, if there ever were snakes in the first place!